We all know that trolls and humans are implacable enemies, but time to time they have to spare each other. Work in teams and let each character get what he is after! Are you ready to play a game about knights and trolls? No, here they won't fight each other for the place under the burning sun. 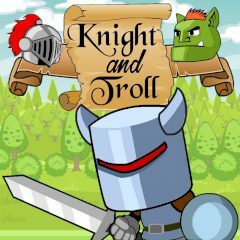 This game is about one knight and his troll friend, that work in teams in order to achieve what they came after. Collect things from the ground and help both characters to get to the exit!